Overview: Calling all sons of beaches (and daughters too!) 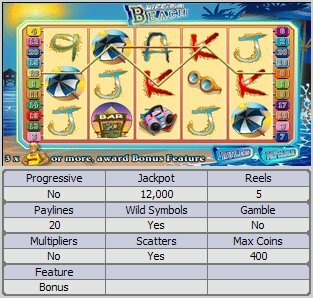 to celebrate the end of winter with a brand new 5 reel 20 line video slot called Life's a Beach. Join us for the super-cool vibe of sparkling waves, balmy beaches, gorgeous babes, long cool drinks and well-bugged lifeguards, where the gaming is safe and entertaining and the rewards generous. Don't miss the muscular lifeguards that act as the Scatter symbol or the wild Life's a Beach babe which can both hand you a handsome reward. With a wide range of wagering options, luck and fast action, this game is full of summer spirit. Similar Slots: If you like Lifes a Beach, you might like these other 5-reel slot machines: Crazy 80s, Jolly Jester, Lady in Red, Liquid Gold Video Slot, Tomb Raider - Secret of the Sword.